New and comfortable and cosy apartment in Bisanne 1500 close (5 km) to les Saisies where you will find lots of shops and restaurants. The apartment has a magnificent view on the Mont Blanc and the Beaufortain. Ski lift next to the apartment (100 m) that will give you acces to the Espace Diamant! There is an indoor swimming pool. In Bisanne there is a grocery shop where you can buy fresh bread every morning, 2 restaurants, 1 bar and 2 ski rental shops where you can find everything you need. the apartment has 2 bedrooms and 2 badrooms. 1 bedroom for 2 persons, 1 bedroom for 3 persons. In the living there is couch that can be converted into a bed. So if needed there is space for 6 persons! Futhermore you will have wifi, dishwasher, fridghe, microwave and washing machine. We are a couple living in the Netherlands, close to Amsterdam and Utrecht. My husband has French roots, but was raised in the Netherlands. We have to kids! We love our apartment in Bisanne 1500 and we have been the first owner of this apartement. We bought it in 2007! We hope you will enjoy your stay. Our cosy appartement offers everything you need: wifi, TV, fridge, nespresso, dishwasher, washing machine and micro wave. The biggest advantage is that it is very close to the ski lift and everything else (supermarket, restaurant etc) is on walking distance! Our apartment is situated at a great location. It has a wonderful view is very close to the ski lift, grocery store, restaurant, bar and ski shop! Busy les Saisies is close, but Bisanne is far more relaxed. A great place if you prefer to stay in a quiet village that offers everything you need! We have been to Bisanne 1500 about 6 times. This apartment is one of the best we have stayed in. It is on the ground floor and very convienient for transferring things from the car to the apartment if you put them on the balcony and then move them into the apartment later. The apartment is well equipped with a TV in the lounge and main bedroom, there is a DVD player in each TV. The WIFI worked well and we were able to get emails etc while we were there which was very useful. We went to Le Refuge in Bisanne 1500 for a meal which was very good. Christine, the owner was very helpful and sent us a lot of hints and tips about the apartment, a quick way to get to the ski lift and other useful information. Hi Graig, thank you for your positive feedback. We are happy to hear that you enjoyed our apartment. You are more than welcome to stay again! We had a fantastic stay in Bisanne 1500. The apartment in Les Alpages de Bisanne complex was perfect for our family of 4. 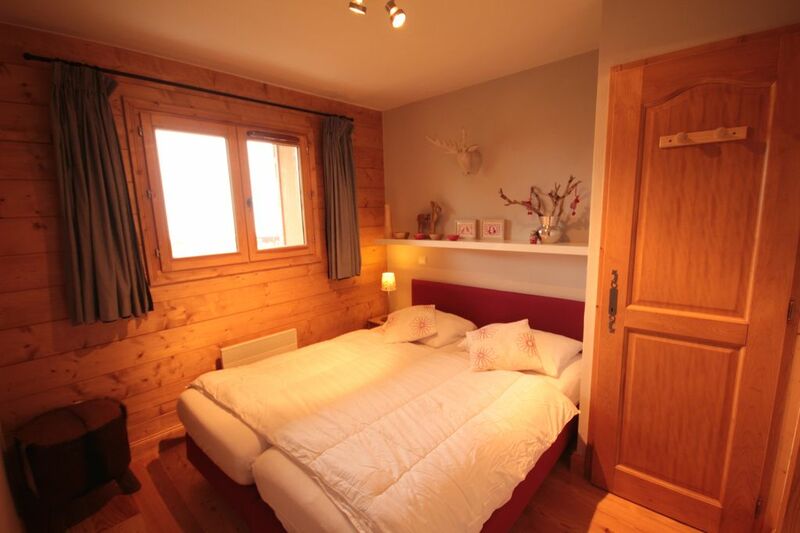 Plenty of space, clean, nicely decorated, well equipped, comfy beds (very important when skiing) and a brilliant location. Only a couple of minutes walk from the chairlift, even less if you go slightly off piste to get back. Kids loved the pool after skiing all day. The owner, Christine, was so friendly and helpful when we had a issue with the WiFi. The resort is very quiet and family friendly. We had lots of fun sledging in the evenings on the empty slope. We fell in love with this area of the Alps and will definitely be returning soon. Both of my kids said that this was their favourite ski holiday to date. The apartment is perfect. Warm, comfortable and close to slopes. I would mention that although there are two bathrooms ( one bath and one shower), there is only 1 WC. Swimming pool is warm and clean, you do have to walk to a separate building outside to access. Improvements could be made with new frying pans/chopping boards and sharper cooking knives. "Swimming pool out of use for the full 2weeks of our stay. Access very difficult due to lack of maintence by staff. Very slippery and in places dangerous - top steps down to the apartment very icy - we had to chip this away ourselves before we could get down to the accommodation. Ventilation system noisy and caused a draught - we did not find the place very warm. Kitchen facilities very limited - lack of workspace made it difficult to cook meals and the location of the oven poor - not easy to reach into the oven without burning yourself on the oven door/sides." when we face extreme snow fall again. meals which offers a lot of extra space. and necessary to keep the air in the apartment healthy. Apparently the apartment was a bit cold. We are very sorry about that. stayed in our apartment and were very satisfied about it. We have stayed in this apartment for the second year now and we are very satisfied. It is situated in splendid surroundings, near the ski piste. The apartment satisfies very well to all our expectations. Everything you might need is present and it is completely arranged and very comfortable. The apartment is also very clean. In short: a nice place to spend a very pleasant ski holiday. In les Saisies you will find lots of shops and restaurants, ski hire etc. Vous payez le tax de sejour à notre agent sur place (Agence Grand Mont aux Saisies). Vous pouvez nettoyer l'appartement vous mêmes ou notre agent s'en occupe. Vous payez les frais de nettoyage à l'agent. L'agent vous donnera la cle de notre appartement. La caution sera remboursée dès que l'agent nous a informé qu' il n'y a pas des dégâts You pay tourist tax directly to our agent in Les Saisies (Agence Grand Mont). The agent can also clean the apartement for you or you can do it yourself. You pay cleaning cost directly to our agent. The agent will give you the key of our apartement. The deposit will be refunded when when our agent informed us that there are no damages etc.